All roads lead to Rome is an old saying. But what will happen if you start in Rome, and let one of the many roads take you where it leads? 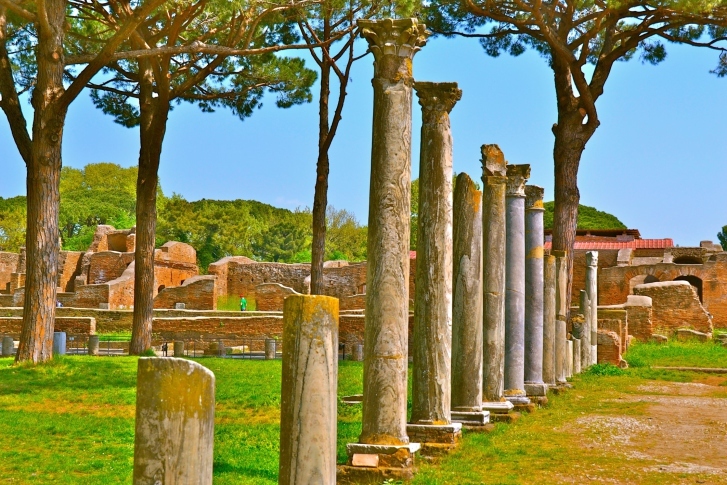 You might end up in Ostia Antica, a beautifully preserved set of ruins about twenty miles outside of Rome. Set between the Tiber River and the Tyrrhenian Sea, this ancient Roman settlement is rich in history. Some of the Ostia Antica ruins are very well preserved. As far as archaeologists can tell, the settlement of Ostia Antica was originally founded as a military settlement, designed to guard the river mouth against naval invasions. Later in time, when the Tiber River was essential to reaching the capital, Ostia Antica became a central naval hub for cargo boats, and its population bloomed until it reached close to 100,000. If you pass through the Roman Gate you will see all manner of ancient wonders left behind by the Romans. Ostia Antica contained an amphitheater that could house about 3500 spectators, and the Baths of Neptune, where a prominent mosaic of the Sea god can be seen. Walking through the streets you can see the public baths, the gymnastics field, apartment buildings, and all manner of other city buildings, the ruins of which are still standing to this day. How soon can I Visit? The hours of operation for the Ostia Antica ruins are 7 days a week, from 8:30 in the morning until dusk, between 4:30 p.m. and 7:15 p.m. depending on the time of year. The earlier the better, as there are many sights to take in, as well as interesting historical facts to learn. One of the enjoyments of visiting this ancient city is reveling in how advanced Romans were for their time. It’s truly a sight to see, as just imagining its glory doesn’t do it justice! 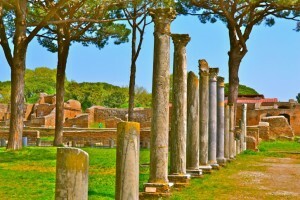 Travel to Italy and see Ostia Antica in person! AESU offers several trips to Italy, including: Cosmopolitan, Explorer, Euro Focus, Great Escape, Viva Italia, and Euro Spree. Explore Italy and its ancient architecture, plus see Ostia Antica and explore the beautifully-preserved ruins! If you have any questions or want help booking your Italy adventure, please contact AESU by calling 800-638-7640, or fill out the contact form found on our website! This entry was posted on Thursday, February 11th, 2016	at 4:00 pm	. You can follow any responses to this entry through the RSS 2.0	feed. Both comments and pings are currently closed.